Turner Prize exhibition organisers are set to permanently ditch controversial terms governing the use of press photos after a row blighted the art show's opening earlier this week, Amateur Photographer can reveal. Turner Prize exhibition organisers are set to permanently ditch controversial terms governing the use of press photos after a row blighted the art show’s opening earlier this week, Amateur Photographer can reveal. Tate Britain is in talks with the Newspaper Publishers Association (NPA) in a bid to agree new terms over the use of press images after photographers threatened to boycott the launch of the Turner Prize exhibition at Tate Britain on Monday. The photographers made national headlines when they were asked to guarantee that none of their pictures would reflect the exhibition in a bad light. Organisers allowed the photographers in, but only after they refused to sign a form that also handed the museum the right to publish their pictures in future without payment. Speaking today, a spokeswoman for Tate Britain confirmed that the museum is in discussions with the NPA, a trade body for national newspapers, and is considering axing controversial parts of the contract. Commenting on its attempt to restrict image use to positive news stories, a spokeswoman told Amateur Photographer this was a ?very old clause?. She said it related to use of images in articles that could be considered ?defamatory? towards the museum. ?We are looking at whether or not to keep it in,? she said. Regarding the right to use images without paying royalties the spokeswoman added: ?We are not going to do that in future.? She said much of the ?review? focuses on ensuring that freelance photographers assigned by a paper to a photocall are not required to sign the form each time they cover an event. 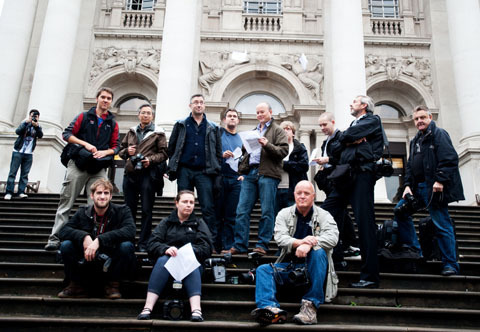 Instead, the Tate hopes that newspaper bosses will agree to sign the form on the photographers? behalf, beforehand, so they don?t have to. The Tate said it hopes to release a revised, agreed, version of the form before its next photocall scheduled for Monday of next week. Earlier this week a photographer who walked out of the press preview blasted organisers for ‘chancing their luck’. Ki Price, who works for the Independent newspaper, was among press photographers left fuming when Tate Britain effectively banned photographs from being used to show the gallery in a negative light (pictured). The NPA could not be reached for comment at the time of writing. Turner Prize organisers ‘chancing their luck’.